Sounds easy, if only we all had a million dollars, right? Well, I’m going to share some of my budgeting tips with you. At age 22, I signed a lease for my very own apartment alone. I checked my budget over and over again. I wasn’t making a lot of money and I still don’t know how I did it, but I made it work every month. Before I officially moved, I decided I would take half of my rent each paycheck, instead of paying the full amount out of one paycheck. I’m not sure where I came up with this idea and I recently found a blog post about it which they called the “half payment method”. It has helped me immensely be able to pay my bills on time and still have enough left over to feed myself. I still continue this method. I also regularly budget. I am very particular about my finances. I’m the crazy person who doesn’t just spend the $50 cash I receive for Christmas right away – I set it aside and forget about it until summer or if something else comes up that I want to do. And lastly, I use my planner to plan out my bills every.single.month. 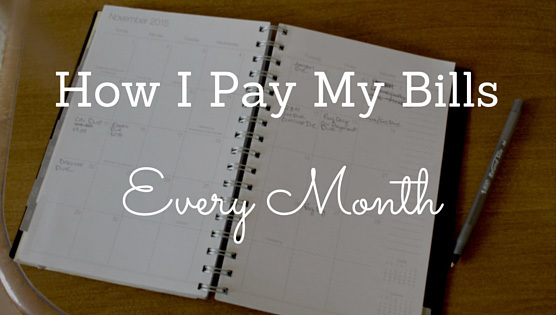 Keep reading to learn in detail how to pay my bills every month! -Using this month (November 2015) as an example, I get paid on the 13th and 27th. -On the 27th, I will move that half from my savings to my checking account and my rent will be scheduled to be paid on the 30th. By using this method, I have allowed myself several more dollars each paycheck for other bills, groceries, savings, and fun. On the previously mentioned blog post I found a while ago, the blogger also used this method for her car payments and such. I don’t. My rent is my largest bill and that is why I do this. You’re probably thinking, “What about my car payment and credit cards…etc?! ?” Here’s the deal…my main concern is keeping a roof over my head, the utilities on, and my tummy fed. I would figure out everything else afterwards. I knew that those were my top priority. If I had to make a minimum payment on a credit card some month, then that’s what happened. NOT the BEST idea! But this is how I made ends meet when I had very little to work with. I also know, (and I’m very fortunate), my family would never let me be without, even though I never asked for assistance. At least twice a month (usually around pay day), I sit down with my planner and check all of the due dates for my bills. Towards the end of each month, I schedule my payments. I pay everything online, whether it be through my bank’s bill pay or on the company’s website. I look at when my pay days are and when my bills are due. I also NEVER base my budget on the amount I have in my checking account. I always use what my paycheck is/will be. This has helped me save a lot of money, because I don’t think about what I have in my account, but rather what I have left over from my paycheck after bills are paid. Usually, I like to schedule my bills the Monday after payday to just get it over with. There’s no point in having bills lingering over those two weeks. Also, you’ll think I’m crazy, at the moment I do not have a budget set in stone for groceries. Maybe I should and will in the future! But I have learned to meal plan the best I can and only buy what I need. I find recipes that I want to make and only buy what I need for them. I also find that going grocery shopping once a week has helped cut down on how much I waste on food. While I think I have my budgeting figured out, I know my next step is to learn how to save. I’m pretty good at hoarding money, but I get anxiety about actually moving money to my savings account. It’s a work in progress! I hope these tips help you learn some new things about budgeting. Of course, as a disclaimer, I am NOT a financial advisor or anything of the sort. This is simply what works for me, but may not work for you. Previous Post: « Hey, World!